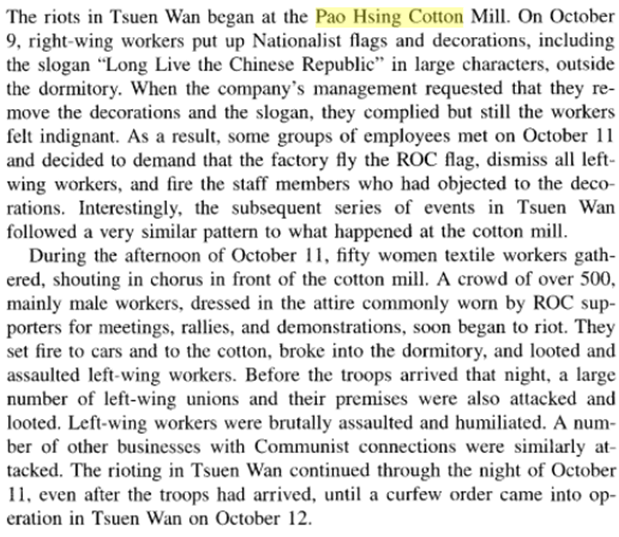 While Pao Hsing Cotton Millmight not have been one of the largest and best-known cotton mills in HK, it was a notable firm in the history of HK cotton spinners for several reasons – its unusual origin (Szechuan rather than Shanghai where majority of the spinners came from), its labor problems (particularly during the Double Ten Riots of 1956), its technical school (being one of the few factories in HK to have one) and last but not the least, thehigh-profile lawsuit filed by the Chinese government in the early 1980s surrounding its ownership. Pao Hsing traced its origin to Pao Yuen Tung HsingYieh (寶元通興業), a diversified business group from Szechuan during the Republican era. Pao Yuen Tung was founded in the city of Yibin (宜賓) in the southeastern part of Szechuan province in 1920 as a firm dealing in pots and pans. Under the leadership of its founder Hsiao Tse-ko (蕭則可) and Cheng Hsing-yuen (鄭星垣), Pao Yuen Tung expanded from metals into different fields such as department store through joint venture with China Products Co and manufacturing by establishing many factories such as the originalPao HsingCotton Mills in Chengdu in Szechuan and Hankow in Wuhan, a toothbrush factory in Chungking and a tea factory in Kunming. It also expanded geographically with branches across China (multiple cities in Szechuan, Kunming, Shanghai, Nanking) and overseas (Calcutta and Karachi). After the War, the group established a branch in Hong Kong called Pao Yuen Tung Trading Co Ltd in 1946with Fan To-tsai (樊陶齋) as manager. As the Civil War situation deteriorated in 1948, Pao Yuen Tungbegan to explore the option of relocating its mill in Wuhan to Hong Kong.In April 1948, the group through its HK branch PYT Trading acquired a 69,696 sqft parcel of land (Lot 102-104, D.D. 355) in Tsuen Wan for HK$140,000. In May, the decision was made to establish a cotton mill in HK on the newly acquired land and in June, the group sent Yang Sen-hui (楊勝惠, 1914-1977)to HK to oversee the construction of the new mill. A native of Leshan in Szechuan, Yang graduated from the prestigious Tsinghua University in Peking with an economics degree in 1936 and graduated from Wuhan University with a master of law in 1939. He workedin the accounting department of the Shaanxi Tongguan Yellow River Bridge construction bureau before joining the PYT group in the early 1940s. In August 1948, Pao Hsing Cotton Mill Co Ltd (hereafter also referred to as “the HK mill”) was incorporated in HK with registered capital of HK$5 millionand paid-up capital of HK$3.5 million – all contributed by Pao Yuen Tung.The management of the HK mill was led by Yang as the manager and 2 colleagues who joined him from Shanghai – Chang Jye-an (張絜庵) who was sub-manager and Tung Teh-mei (董德美)who was assistant manager although they were only 3 of the total 21 shareholders of the HK mill (most of them in the mainland) and collectively only controlled 5000 of the firm’s 50000 outstanding shares with Yang serving as one of the original 7 directors. Hwang Liang-chen(黃涼塵, 1912-2004), who joined PYT as an apprentice at the age of 14 and rose through the ranks to become the head of the PYT group, was president of Pao Hsing at its launch.10,000 spindles were acquired through the engineering firm Andersen Meyer at the cost of US$398,500 and Shanghainese architects Su Gin-Djih (徐敬直) and Wu Chi-Koei (吳繼軌) of HsinYieh Architects were hired to design the new plant.When production commenced in November 1948, Pao Hsing was one of the five cotton spinning mills launched in HK that year and the only spinning mill not started with Shanghainese capital. According to court documents, the first two years of Pao Hsing in HK were difficult, with losses of over HK$900,000 in 1950 and losses of over HK$120,000 in 1951. During this time, several seismic changes also took place. Under the leadership of the left leaning Hwang and Fan who were working closely with Deng Xiaoping, then Communist leader of the Southwestern provinces,Pao Yuen Tung in the mainland became a state-owned enterprise in January 1950, one of the first companies in the country to do so.The Korean War also erupted during this time and as a result, embargo was imposed on any companies associated with the mainland. With this backdrop, Yang convinced Pao Yuen Tung’s managementthat it was necessary for the HK mill to sever its ties with the mainland parent in order tocircumvent the embargo and survive. 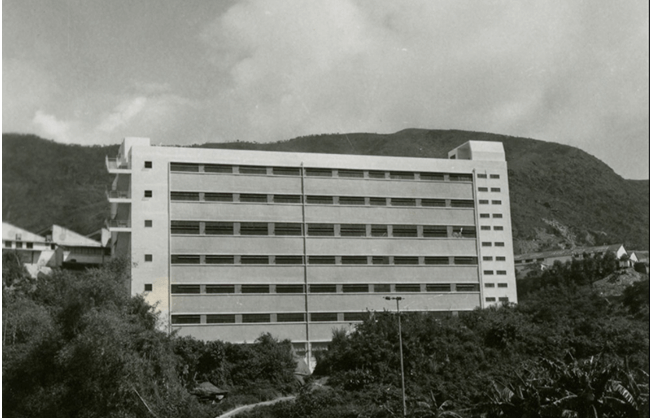 In 1951, PYT Trading, which was in the process of winding down (ultimately dissolved in 1958), transferred its land in Tsuen Wan and dormitory property in Wing Lok Street in Sheung Wanto the HK mill.State controlled Bank of China was dropped as the mill’s corresponding bank in favor of HSBC. By late 1952, Yang, Chang and Tung managed to remove all the mainland-based directors and shareholders of Pao Hsing and effectively took over the firm. A new Pao Hsingboard was formed in 1953 which included the trio (with Yang as chairman) and two new directors – the US educated Hu Ying-choi and Ku Lan-san. This series of action would become the center of the ownership dispute almost three decades later. In the mid-1950s, the macro environment improved and under the leadership of Yang, Pao Hsing began to turn a corner and prosper. After the riots, business continued to expand at Pao Hsing and a second mill was built at Nos. 415-431 Castle Peak Road, Kwai Chung (also known as Lot 696, D.D. 445). A seven-story building with over 100,000 sqft of space, it was the largest mill in the Kwai Chung area. In the 1960s, two of the three key executives at Pao Hsing passed away – Chang died first in February 1963 followed by Tung in November 1966, leaving Yang solely in charge. In 1964, a Pao Hsing worker was murdered at the Kwai Chung mill and 7 perpetrators were later arrested with one sentenced to death, one released and the remainder being sentenced to few months to a few years of jail time. In 1965, the decision was made to close the Tsuen Wan Mill (aka Mill No. 1) and to consolidate all production at the Kwai Chung Mill (aka Mill No. 2). The 400 workers at Mill No. 1 protested the move (a bomb was mailed to the Kwai Chung office in October which injured 3 staff members), storming the firm’s Prince’s Building office where Yang responded to them by phone as he was out of office and the dispute was resolved with the intervention of the Labor Department. By the 1970s, Pao Hsing had 24,420 spindles and 554 looms and annual production of 10.44 million pounds and 21 million square yards according to its profile in the HK Cotton Spinners Association reports. Its product brands were “Ameto” and “Double Ring”. 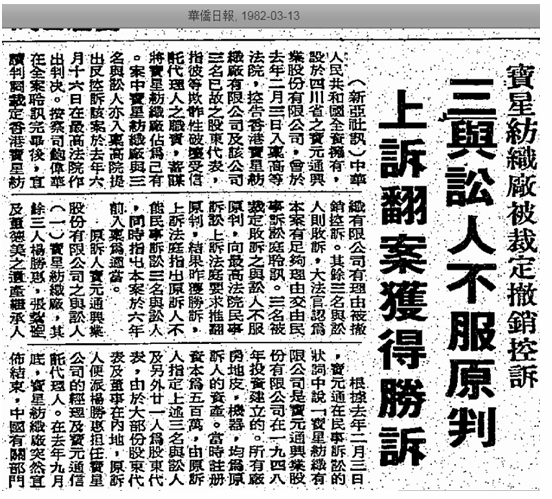 According to above Ta Kung Pao article which interviewed an individual connected to the firm, Pao Hsing had its best year in 1976. In September 1977, Yang Sen-hui died suddenly while vacationing in the United States at the age of 63. According to court documents, Yang’s widow Shum Yuk-sin (沈玉仙) and their children controlled 70% of Pao Hsing’s shares via Hin Chee Co Ltd as of 1978. The firm still recorded a profit of HK$2 million in 1979 but orders declined in 1980, resulting in monthly losses of over HK$600,000 that year. At the meantime, the property value of the Kwai Chung factory site had soared, attracting the interest of developers. In September 1980, the Yang family decided to shut down Pao Hsing’s operations and laid off the remaining 300 workers. This immediately drew the attention of former PYT executives in the mainland who sent Fan Tao-chai to HK to negotiate with the Yang family who were planning to sell the Kwai Chung site. 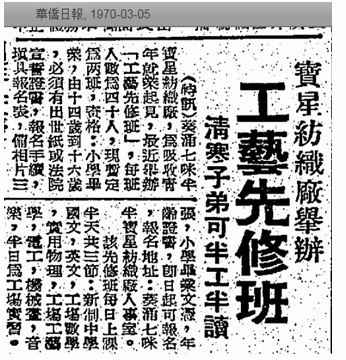 When the talks failed, the state-owned Pao Yuen TungHsingYiehfiled a lawsuit in the Supreme Court of HK in November 1980 against Pao Hsing and the estates of Yang, Chang and Tung stating that PYT was the rightful owner of Pao Hsing and its properties and asked the Court to halt any sale. The three estates asked the Court to drop the case in February 1981 based on statute of limitations (since PYT had almost three decades to sue them and did not) and during the trial, PYT’s lawyer Martin Lee Q.C. said that PYT had over 1000 documents which proved that Pao Hsing Cotton Mills rightfully belonged to PYT and Yang, Chang and Tung were employees who breached their fiduciary duties. In June 1981, the Court dropped the charges against Pao Hsing but ruled against the three estates. The three estates appealed the judgement and in March 1982 won their appeal. Unhappy with the outcome, PYT told Ta Kung Pao that they would appeal to the highest appellate court in HK at the time – the Judicial Committee of the Privy Council in London although it is unclear if they did indeed follow through. As a firm, Pao Hsing Cotton Mill Ltd was finally dissolved in 1999. This article was first posted on 16th August 2018. Q+A39 Was cotton grown in the New Territories post 1898?